I think we’ll see oil at $75 by the end of the year. As Matt noted, Venezuela’s slow-mo collapse is one big reason to keep you bullish on oil. Slow-mo growth — coming soon to the U.S. shale patch. Yeah, yeah — oil shale production is growing like crazy now. According to a newly released report from the U.S. Energy Information Administration, U.S. production of crude oil rose 5% last year. We hit 10 million barrels a day worth of production for the final two months of 2017. That’s huge — a monthly record has not seen on U.S. shores since 1970. With that in mind, shale driller stocks ought to be flying high, with “Happy Days Are Here Again” playing at full volume in the background. Knowing why shale drilling stocks are flailing is crucial to understanding why oil prices will keep moving higher. 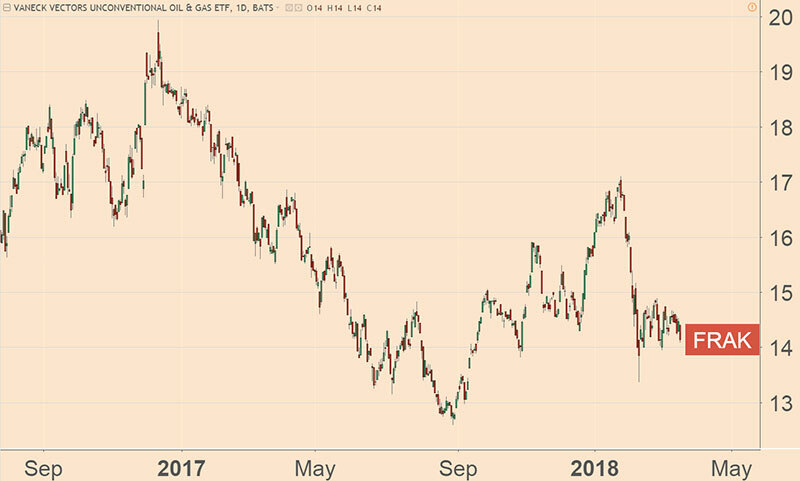 We can see the disconnect with the VanEck Vectors Unconventional Oil & Gas ETF (NYSE: FRAK). It’s down 10% so far for 2018. Since the start of 2017, FRAK fell more than 20%. One, if you’re a shareholder at a shale-drilling company, you’ve been down this road before. You’ve heard all about the tech-intensive leaps in production growth. But where are the profits? There aren’t any (at least not for any consistent length of time). Two, shale drilling is capital intensive. But with interest rates on the rise, and the Federal Reserve seemingly on course to hike them up to four more times this year — the cost of capital ain’t getting any cheaper. The main takeaway: U.S. oil production will continue to grow. But it’s not going to grow the way shale proponents claim. When the rest of the oil world reaches that conclusion, look out. Oil prices will shoot higher, and so will share prices of Big Oil stocks. I’d look at the Vaneck Vectors Oil Services ETF (NYSE: OIH) as one way to profit from this long-term trend. Translation: Investors in oilfield services stocks ought to make a lot of money in the next few years.